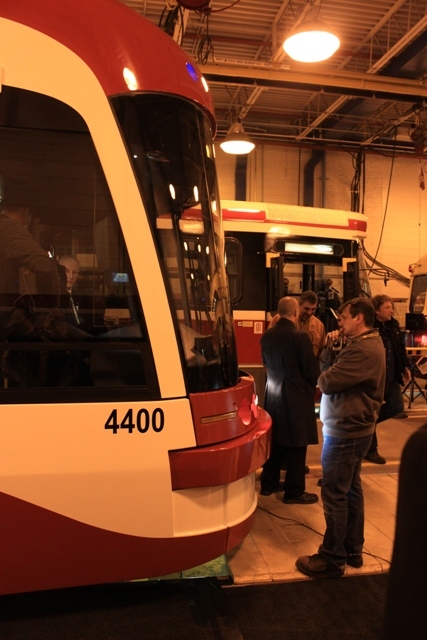 The TTC unveiled the real car 4400 — not the imitation, half-car mockup seen on an earlier occasion — at its Hillcrest Shops today to a crowd of press, politicians and staff. Representatives of all governments were present. Councillor Karen Stintz as TTC Chair, Ontario Minister of Transportation Bob Chiarelli, Metrolinx CEO Bruce McCuaig, and Peter Van Loan representing the Federal Government. Van Loan’s inclusion was rather odd considering that his government famously told Mayor David Miller to get lost (in somewhat earthier terms) when Miller asked for a 1/3 federal share in funding these cars. Now we learn than some of the federal gas tax transit revenue in Toronto has been earmarked for the streetcar project. In fact, Toronto gets a flat annual allocation from the federal gas tax that now runs at $154m. In 2012, the total TTC capital spending (not including projects with their own accounts such as the Spadina extension) will be $1,034m. This puts the federal gas tax at about 15% of current spending although the proportion rises in future years when the currently planned rate of spending tails off. I have asked the TTC to explain how they came up with the $108m figure, and as I write this (2:20 pm, November 15), I have not received a reply. Federal capital grants go into the general pot of capital funding (see pdf page 36 of the TTC Capital Budget). During her remarks, TTC Chair Karen Stintz joked that she hopes to see Van Loan back soon with a big cheque for the Downtown Relief Line. This is a fully working car, although we won’t see it out on the street for several months, and even then only for test runs, not in passenger service. Cars 4401 and 4402 will arrive over coming months to add to the test fleet. 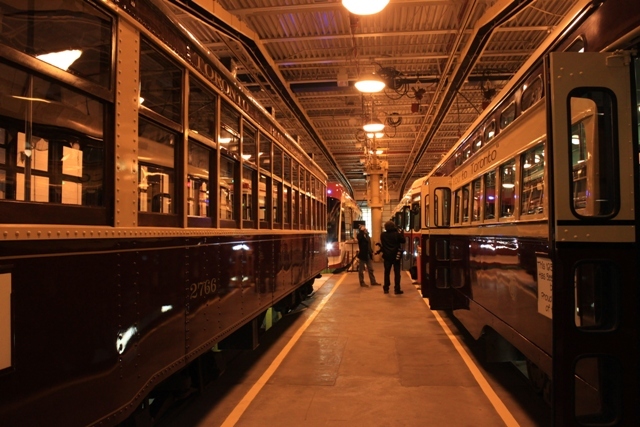 The 4400 sat among representatives of three earlier generations of streetcars each of which represented the technological pride of its age — the Peter Witt (1920s), the PCC (1930/40s), the CLRV (1970s). That CLRV (and its relative, the articulated ALRV) is odd man out, in a way, because it was, in part, the product of an era when Ontario thought it needed to reinvent the streetcar. Only one other buyer was ever found for these vehicles as compared with Witts, PCCs and now Bombardier Flexities running all over the world. 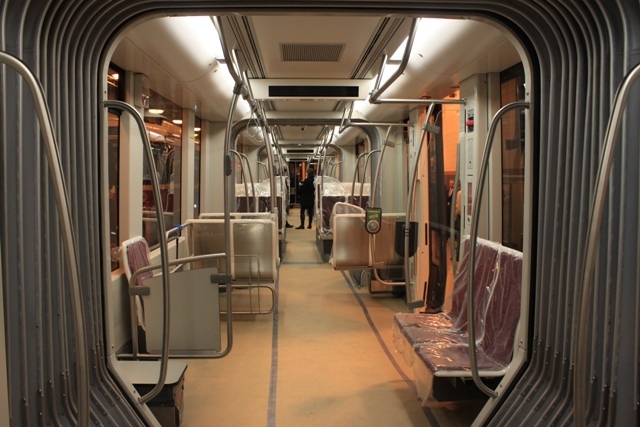 The car’s interior is divided into sections, each with its own door very much like a subway car. All-door loading will spread out the demand through the interior. Space dedicated for large objects such as shopping buggies, baby carriages, wheelchairs and bicycles will allow them to be carried without plugging circulation. Although the cars are “low floor”, there is still one step up from the ground into them unless one boards from a platform or widened sidewalk (as on Roncesvalles). However, that’s the only step, and riders will be able to flow into and out of the cars quicker than they do on the earlier models. Visible in the photo below is a small pedestal (left side, just ahead of the articulation) which will hold the fare equipment. This will be used by passengers who need to pay a cash or token fare while the system is in co-existence mode between current practices and Presto. Machines will also be provided at busy stops along the routes as the new cars roll out. The box under the pedestal is a heater/blower (another is located under the seat just inside the door) whose purpose is to keep the vestibule warm even in the winter and an attempt to dry out the floor. Stop displays hang from the ceiling through the length of the car, not just at the front as on the retrofitted CLRV/ALRV fleets. Notable by their absence is any provision for advertising on either the interior or exterior of the car. Something may be fitted in the coves between the top of the windows and the lighting strip, but there is nothing on the 4400. This would change the look of the cars inside and out. Here is another view through the articulation showing the fare machine pedestal. Note that the window has a separate panel at the top. This is a “flip in” window similar to those on the CLRVs intended for situations where the AC fails and some ventillation is required. The flip-up seating in the area beyond keeps it clear for use by wheelchairs in a similar format to that already used on the subway. 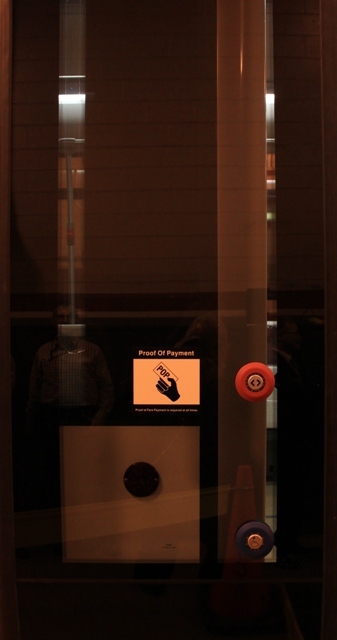 At the doors, there is a red button for passengers to open them when they are activated by the operator. Actual operation will likely vary from stop to stop and car to car just as it does today with the CLRVs. At some stops, the operator will simply open all doors; at others, only doors passengers want to use will open. This is a common practice elsewhere to which Torontonians will, I am sure, adapt. This door is also the wheelchair location, and the blue button is intended for a request to deploy the wheelchair ramp. That ramp has two levels — one is a short bridge to get from a car to a nearby platform, the other is a longer ramp to get down to pavement level. The operator controls which version is deployed. Not visible in these photos is an LED strip mounted on the trailing edge of each door. This will be brightly lit when the doors are open as a warning to passing motorists and cyclists that they should stop. I hope to get a photo or video of this in operation from the TTC and will add it here when available. Low-floor design brings seating above the wheel sets, and a mixture of forward and rear facing seats. The front of the new car, in profile, can be read as a face, here in contemplation of a human. The paint treatment at this end is different from the rear (see the next photo) with the white stripes swinging down. The rear end of 4400 seen from the transfer table. The white stripes at this end simply wrap around the car. Finally, a view along the runway for the transfer table that moves cars and buses between the shop entrance and the various repair bays. The mockup version of 4400 is visible in the middle distance. I must say that having a genuinely new streetcar in Toronto, one that is based on a proven international design, gives me good feelings. All the same, there remain questions of how the vehicle will perform in service, how riders will adapt to the new layout and fare collection tactics, and whether the TTC will actually improve service capacity (as implied in the Fleet Plan that I reviewed recently) and improve line management so that expected wider headways are not compounded by ragged service and short turns. The fight for better streetcar service is far from over. 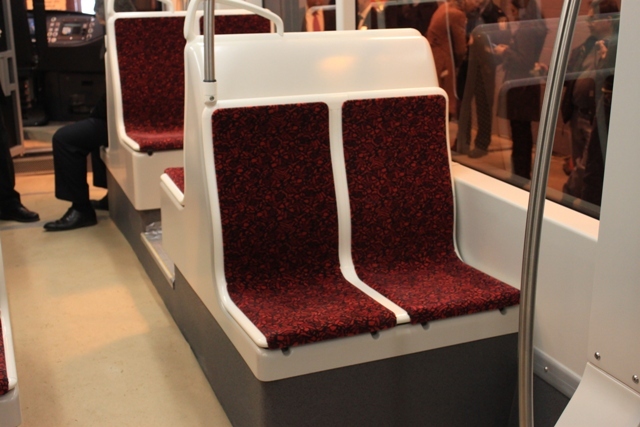 The use of a different, patterned seat fabric rather than the standard TTC red. The use of a darker red than the bright cherry found on the CLRVs. It is not as dark as the colour used with cream trim on the PCCs and Witts, but not as bright as the CLRVs. The presentation of a distinct “front” and “back” to the cars by bringing the white stripes down at the front of the car. The presentation of a uniform black stripe down the side of the car (the original version made the doors look like a mouth with missing teeth). One thing we hoped to see was interior surfaces that had some texture and variation from lighter off-white on the ceiling to a darker gray on the floor. That idea did not become part of the final version probably for a combination of cost and maintenance issues. Eventually the cars will go into service and we will see how their layout works in practice and whether it can be improved. An idea I would particularly like to see would be a subset of the fleet as “art cars”. We came up with this idea before GO Transit started its own program, but given the state of transit funding and municipal attitudes to non-essential “gravy”, this was an idea that has gone into a deep sleep. Could we find a sponsor to underwrite a competition for, say, ten cars each with its own “total wrap”, a set of “one of” cars whose designs would change from season to season, year to year? 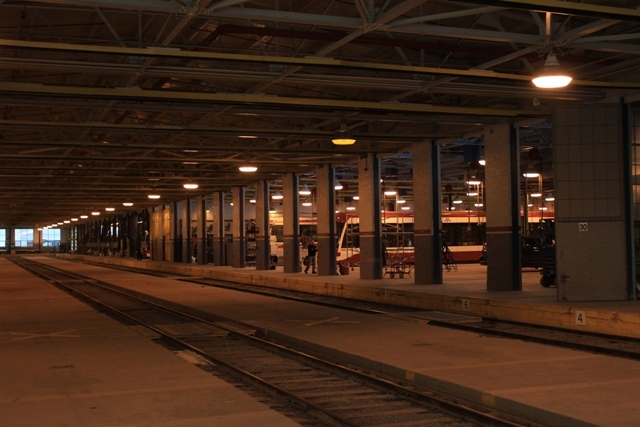 Actually, I wonder if the real reason is that they would have been too short to have them delivered with a trolley pole and a pantograph installed and thus faced with rebuilding them at some point to install a pantograph, the TTC took the easier option and ordered the full length Flexitys. Steve: I don’t remember any discussion at the time of a shorter version. Also, originally, the TTC seemed set on staying with trolley poles which is why the conversion of the overhead infrastructure didn’t start earlier. I’ve seen a feature on Bombardier’s website called the MITRAC energy saver, which as far as I can tell is a capacitor that stores braking energy and allows for operation off wire for a short distance, and claims energy savings as well. Is it known if the new streetcars will have this feature? Steve: Yes, I believe that they do, although the Bombardier handouts merely refer to “energy efficient systems” without naming them explicitly. 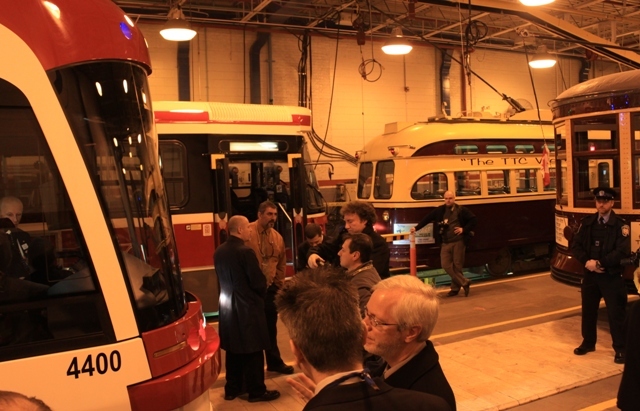 It is worth remembering that when the TTC ordered its cars, the Flexity 2 had not yet been announced, and it was the first on which Mitrac energy saving equipment is listed as standard. 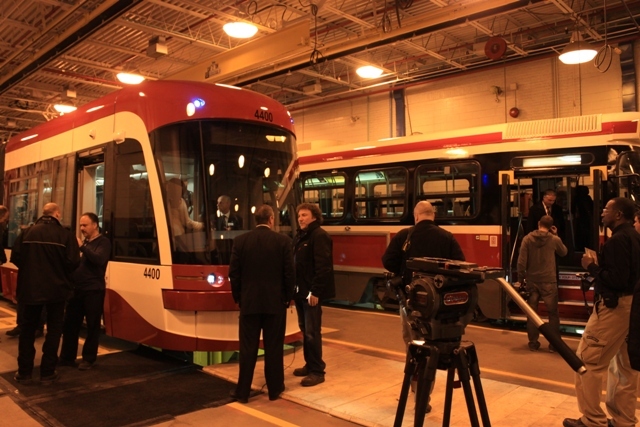 The Toronto car is a hybrid of “Flexity 1” plus some of the features of the later generation car. Is there an option for more streetcars that could be added near the end of the order? Steve: Yes. The original contract with Bombardier included provision for the Transit City cars as well as the “legacy” fleet replacement. Beyond the 204 original legacy cars, the TTC had an option for 400 more. When Metrolinx took over responsibility for the TC lines, the TTC assigned part of the contracted volume of cars to them, but kept some for additions to the “legacy” system fleet if need be. The exact split was not part of the public report. Note that the Kitchener-Waterloo project will also acquire cars through Metrolinx and will soak up some of the overall room in the contract. All that said, a total of 604 cars is a huge fleet, much bigger than the TTC streetcar fleet was at its height, and so there is a lot of room for growth. My question is why did the commissioners under Giambrone stop at 30 metres, and not go longer? Is there a part of the streetcar system that cannot hold 40 metres that I’m forgetting? (I’ve assumed that an addition of 2 modules is 10 metres, based on an earlier comment by Nick L). Spadina Station Loop can only hold three CLRVs (about 1.5 LFLRVs) unless the TTC changes the way that it uses the platform space. St. Clair West Station Loop can only hold two CLRVs (one for eastbound, one for westbound) at the loading platform. How this is going to operate with 30m cars, I don’t know. Broadview Station Loop cannot hold three CLRVs on the inside (King) track, only one CLRV plus one ALRV. A longer car is possible, but only just, at Broadview. Union Station Loop is certainly small, and even the proposed new layout is designed for 30m cars. Given the point where the turnoff to the Bremner line (which may never be built) would be, expanding to longer cars would be difficult. And, of course, all of the new safety islands and similar construction on St. Clair, Spadina/Harbourfront and Roncesvalles have been designed for 30m cars. I’d just like to point out that we should be grateful that they didn’t go with longer cars based on how the TTC calculates their schedules. (Think “the larger the vehicle, the smaller the number that run every hour”) That’s why, hopefully, the TTC will take a long, serious look at getting shorter Flexitys at some point in the future before the production line in Thunder Bay shuts down. At off-peak times, and on less busy streetcar routes, we expect to have little or no change to the frequency of service. 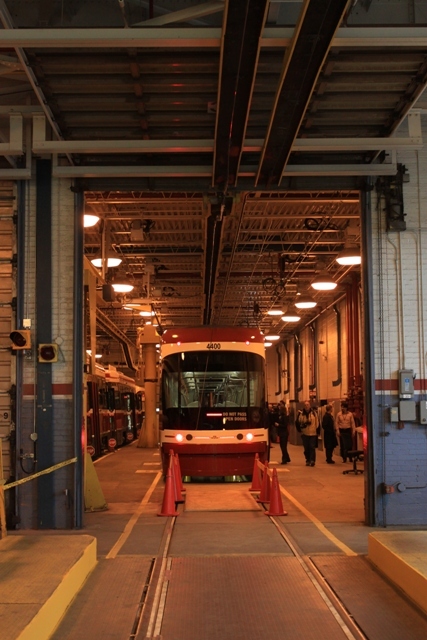 The new streetcars will provide more capacity than is provided by the current service. It will be intriguing to see how well they hold to this when the rollout actually starts. One obvious comment about the 40m car that Steve did not mention is cost. I’d assume it would cost more to construct an even longer car. This might have lead to even few cars purchased and thus even more reduced service frequency. As has been pointed out earlier in this thread, the real enemy is the small fleet order, not the length of the vehicle, and it’s really disappointing me to see streetcar advocates attacking one of the best features that’s supposed to be an improvement and totally ignore the real problem here. I also think shorter-streetcar-advocates may be underestimating the unit cost of shorter streetcars per passenger space. The cost does not vary proportionally with vehicle length because of fixed components such as driver cabs. A fleet order of 340 three-module streetcars would probably be more expensive than 204 five-module streetcars we’re getting. It’s just like saying LRT will provide more frequent service than subways, just because LRT has a lower capacity per vehicle than subways. This argument was made during the LRT-versus-subways debate by the Pembina institute, and we all know it’s one of the BS LRT arguments. Frequency driven for service quality should be independent of the individual vehicle capacity (provided that frequency isn’t driven by capacity demands). The TTC can run frequent service with long streetcars if it wants to, and the real objective here is to convince them that they should maintain their frequencies, not decrease vehicle capacity. Are there any modern streetcars with external bike racks? The internal space is nice, but I very much doubt that there will be room for even one bicycle in the streetcar in rush hour. Despite the “there’s room for one more on the roof” attitude towards crowding, I have yet to see passengers riding on the bus bike racks. So there, unless there are already two bikes on the rack (which is unthinkably rare), you have a place for your bike. Steve: Such things do exist, but I would not hold my breath to see them implemented here. 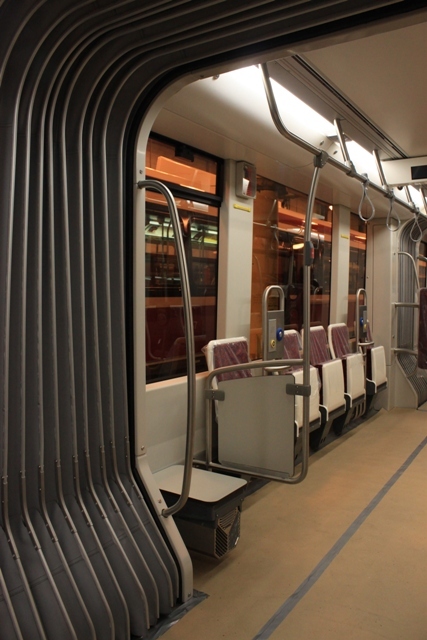 Front racks such as those on buses are not likely because of both the car’s profile and clearance issues on curves. Any kind of supplementary storage such as a trailer brings problems of its own with how it would perform as part of a “train”. I could be quite cynical about this and suggest that cyclists will display their well-known sense of entitlement to occupy the space reserved for them inside the new streetcars. This also brings us to the question of the TTC’s general prohibition against bicycles on transit vehicles during peak periods, but that’s another issue the TTC will have to decide. And since the TTC uses capacity demands to determine frequency, at least when politics don’t get in the way, you start to realize why I was suggesting the TTC look into purchasing shorter Flexitys once the current order of 204 is filled. In addition, unlike with the shorter buses debate, additional maintenance costs will be minimal due to them using the same parts supply, maintenance facilities, and repair personnel as the 30m Flexitys. However, there is the question of yard space. It appears to me that if capacity is the determinant for frequency, then it has been applied to surface transit routes only. For some subway routes (Sheppard), the frequency provides way more capacity than required. This double standard is the real problem that I am trying to highlight. I also outright disagree that we should purchase shorter vehicles just to appease the TTC’s double standards. I see nothing wrong with politics intervening to ensure system-wide frequent service is provided above what capacity would require. Don’t insist on making vehicle capacity and service quality enemies here. I would be interested in reading your response, but this is probably the last time I’ll post about why we shouldn’t go with shorter streetcars. Steve: The TTC’s Service Standards are very generous to the subway with a policy headway maximum of 5 minutes at all hours. A related issue is that the cost of just having the subway open is substantial with station and maintenance staff who must be available even if the trains are not heavily used. As I said in a previous response, the TTC website claims that service will be improved with the new cars, and that off-peak headways will generally not change. We shall see. Steve: Thanks you for mining my old archives. I am not sure whether 300 actually was the finally number Metrolinx took, but can check on that. What are the loading standards for the subway lines on Saturday’s. I complained recently to TTC that the Danforth line east out of Yonge at 5:30 pm on a Saturday is always packed very tightly with the 5-minute frequency, and asked what the Saturday afternoon loading standards where, and the response I got was that they couldn’t tell me, because it changes all the time during the day (???). Steve: According to the most recently published standards (2008, at page 8), the off-peak subway average load should be 500, a seated load. We know perfectly well that it’s worse than this at many times of the day, but in these times of fiscal restraint, don’t expect to see much change. For frequent surface routes, the new Ford/Stintz standard is a seated load plus 20%. Depending on the vehicle in question, this can be close to a peak period standard load, but don’t let that bother the folks who also tell us about the importance of “customer service”. It will take us years to get back to a Miller-era service standard because many other things such as keeping up with growth will take budgetary precedence. Ironically, talking about longer & shorter versions of the Flexity makes me think of the flexibility of the old streetcars and the ability to easily combine them into trains. I guess they never went beyond 2 car trains (with the PCCs) in Toronto, but I wonder if there were any other cities had longer versions of streetcar trains? Steve: The longest I know of was in Cleveland with 5-car trains, although I believe that these were rare. Boston routinely ran 3-car trains in the peak period. The advantages of the low-floor, multi-segment car have to be weighed against the flexibility of the older streetcars. I suppose it would be nice if there was a compromise product (but the TTC rejected anything less than 100% low-floor). Well, perhaps one day Bombardier will have a ‘flexible Flexity’ with segments that can be swopped in and out as needed. I also noticed a Globe & Mail article using 182. Steve: It’s likely that the cars for KW will come out of the Metrolinx allocation as well. Over the next few years, it’s hard to predict the movements in city and provincial politics and planning and how this could affect the number eventually acquired. Thanks for that. 396 would be a seated load, so 1 passenger per every 4 seats extra. My own observations at about 5:30 pm on Saturdays would be a lot closer to 3 or 4 passengers per every 4 seats extra. Closer to 800 per train leaving Yonge – perhaps a little less as the ends are likely emptier. Still it suggests they are ignoring their own loading standards. Steve: A point of clarification. When the 500 standard was set, this was based on the seating layout of the earlier H series cars which held 20 passengers per “compartment” except for the space taken for the cab. One car’s seated load was 76 making a trainload 456, not 396. Of course the standards have an escape clause saying “subject to budget” which has been used to avoid all sorts of otherwise justified service increases. I believe that I saw a few 3 car trains of articulated cars in the rush hour on Riverside in Boston last May. Steve what is the number of cars operating when all the lines are in operation with streetcars? Steve: The last time this was the case was over winter 2011/12 before reconstruction of Spadina and Harbourfront started. The total number of CLRVs in service is actually slightly higher because of some trippers that were not included in the route-by-route counts in the service summary. I believe that some lines that run with headways approaching 2 minutes would operate more efficiently with a 3 minute headway as this would reduce the problems of too many streetcars trying to get through the same traffic light cycle. This would mainly affect King and Spadina and would increase the capacity by 1/3 if they ran LFLRV’s instead of CLRV’s. Of course every second car on Spadina would need to go to Union. Steve: The TTC has the same attitude to close headways. I am not convinced that the benefit would be as great as claimed given bunching that happens naturally anyhow due to less than rigourous headway management. Also, the worst locations (e.g. Spadina and King) have other problems including the lack of transit priority signalling for the west to north turn and construction activity. Queen & Roncesvalles has a long three-phase cycle that more or less guarantees no more than one car per phase per direction. This is compounded by stop placement and cars pausing to enter the carhouse. Some locations have the effect of overlapping routes, notably Broadview and Queen. Finally, the TTC adds to delays at stops by insisting that cars pull right up to the stop before opening their doors. This generally adds one traffic signal cycle to stop service times. Many operators ignore this rule, and their trips run noticeably faster as a result. Re Mikey @ Deborah Brown, the Skoda-Inekon design for Toronto is here. It is designed for 12 metre curves, unlike the Skoda 15T which is designed for 18 metres (15 Metres in depot) and it is 100% low floor. If you were able to have the 15T you would have most seats facing forward. I don’t know how riders will take to travelling backwards as I imagine they would be used to facing forward in the existing streetcars! The Skoda-Inekon design also has a decent number of doors unlike the Bombardier which will prove its Achilles Heel in a busy mid-city environment. But I understand that consortium was ignored because the streetcars had to be built in Canada. Pity. One suggestion with the ticket readers – they should be on the stanchions on the other side of the aisle opposite the doors, not in the doorways themselves. Having people blocking the doorway while swiping tickets blows out the dwell times. Better to have people inside the streetcars doing this, leaving the doorways unobstructed for movements.